After this morning's two mile jaunt, Scott and I went to breakfast at IHOP with our friends, Keith and Julie. I ordered an omelet (request just eggs...otherwise you will get their omelet "mixture" which contains a small amount of pancake batter, used to "fluff up" the omelet...yes, strange) with spinach only and a bowl of fruit, instead of the standard side of pancakes. The waitress looked around the table in a sort of disgust and said, "Anyone want to order "real" food!? "...hmmm...I thought that was what I did. Oh well...maybe one day she'll experience the joys of Paleo. Tip: This has been my go-to meal lately. 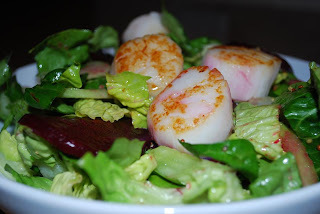 I pretty much always have scallops in my freezer (I just take them out in the morning or the night before I want to eat them and then put them in a bowl, covered with saran wrap, to thaw in the fridge). The lettuce, I clean, spin, wrap in a clean dishtowel, and store in a tupperware container for easy use. And, the beets were roasted (toss whole, cleaned beets with EVOO, a little sea salt, and pepper, wrap in foil, and roast at 400F for about an hour), peeled, and sliced in advance for snacking or tossing in a salad. Whisk ingredients in the bottom of your salad bowl. Toss with lettuce and any other vegetables you wish to add to your salad. We wrote down our favorite and least favorite movements (fifteen total) and then mixed them up in a bowl. We decided to pick five movements, as opposed to four, and did each movement six times for a total of thirty rounds, as opposed to eight times for a total of thirty two. Doing five movements made me feel like I could increase my odds of getting at least one of my favorites...plus, I like odd numbers. *And, since we were doing a Tabata workout...I downloaded this totally cool timer to my iPhone. Love it! When all was said and done, I got a good mix...I LOVE kettlebell swings (thanks to a visit from Melissa Urban and Dallas of Whole9, back in August, I not only love kettlebells...I can swing way more weight and am feeling it in all the right places! ), I found that I don't mind sumo deadlift high pulls when using a kettlebell, and the other movements I don't love, but don't really mind. Scott, on the other hand, got thrusters and push ups...I HATE them both! Note to self...work on thrusters and push ups. Push ups...a work in progress! This was a great 15 minute WOD! Thank you Melissa!